Submitted by Andrew on 03/27/2019 - 5:09pm. The Woburn Recreation Department will be running a City Wide Community Yard Sale on Saturday, April 27th (Rain Date April 28th). 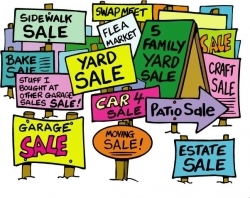 If you are interested in having a yard sale at your house and would like to place your house on our community yard sale map you can find a registration form online at www.woburnrec.com or at the Recreation Office. The cost to place your house on the map is $10. All registration forms must be sent to the Recreation Office no later than April 19th to guarantee a spot on the map. If you are interested in attending all of the yard sales on April 27th you can pick up the map at City Hall or view it online after April 24th.